This is a fun spin on lasagna. Some of my family prefer this version of lasagna to the Italian version. I have adapted this recipe from a Taste of Home Magazine from December and January 2008. 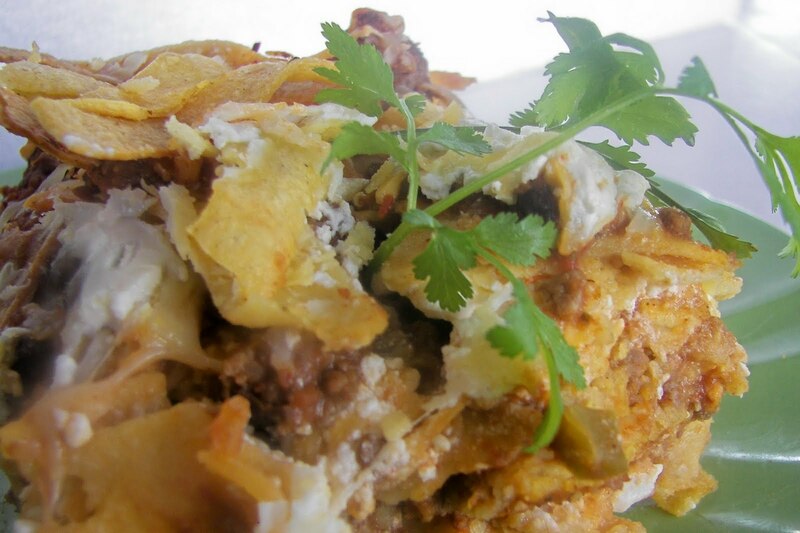 I make it with corn tortillas rather than noodles and add baked tortilla strips to the top. 1 can (16 ounces) refried beans -- Fat-free is fine. 1 cup salsa -- I use Pace mild. Make baked tortilla strips first. Cut 3-4 corn tortillas in strips. Dredge in slight amount of olive oil and sprinkle scant amount of salt on strips. Bake in 350 degree oven, turning every 3-4 minutes, for 10-15 minutes. In a Dutch oven, cook beef and onion over medium heat until meat is no longer pink and drain. Stir in the beans, tomatoes, salsa, chiles, and seasonings. In a bowl, combine the Monterey Jack and Mozzarella cheese and set aside 1-1/2 cups of cheese mixture. Stir cottage cheese and 3/4 cups sour cream into remaining cheese mixture. In bottom of a greased 13 x 9 pan place 6 corn tortillas: three whole tortillas in the center. Then halve 3 corn tortillas and place 3 halves on the left side of the center tortillas and three halves on the right side of the center tortillas. 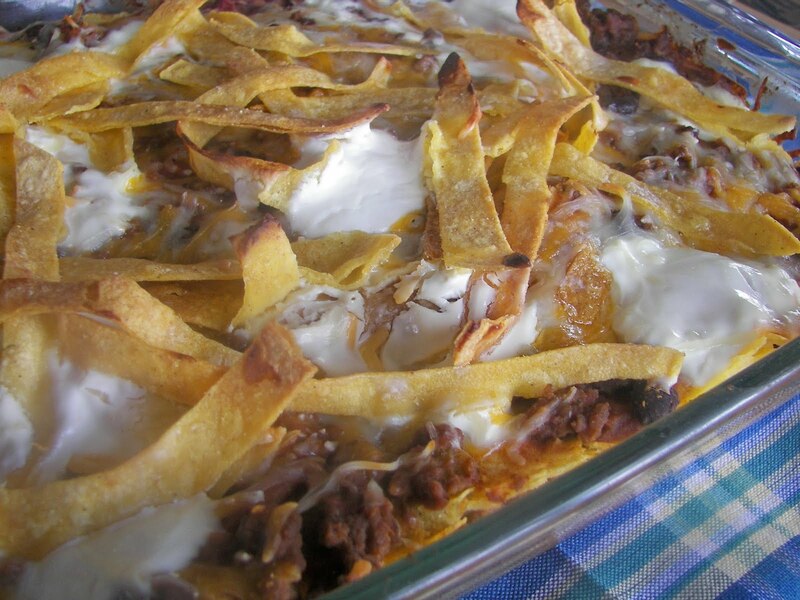 Layer with a third of the cottage cheese and sour cream mixture and meat and bean sauce. Repeat layers of tortillas, meat and bean mixture, and cottage and cream cheese mixture two more times. The dish will be full and heavy! Bake covered at 350 degrees for one hour. Uncover and then spread with remaining sour cream. Sprinkle with reserved cheese and place tortilla strips on top and bake 10-12 minutes longer or until cheese is melted. Let stand for 10 minutes before serving. Serves 12. Hi Joni! What a delightful blog you have here! I have perused many posts and loved each one! This looks wonderful! You've got me hungry...I love the change from noodles to corn tortillas. Oh, dear! This looks amazing! I think I will have to make this for my boyfriend some time because he loves Mexican food. I think he's die for this fun spin on the Italian classic! Thanks for the recipe!